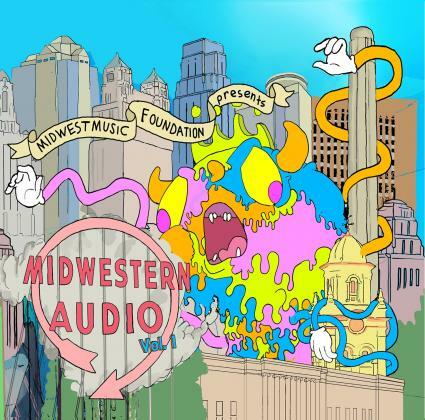 With a generous helping of diverse musical ranges and genres, Midwest Music Foundation's Midwestern Audio Vol. 1 is undoubtedly The Deli KC's October CD of the month. Including 41 tracks from some of Kansas City's most talented musical acts, there's something for any musical fan. The double CD compilation was assembled by Brenton Cook. It ebbs and flows between catchy pop beats and psychedelic freeform sounds, and then between metal and gentle folk tunes. The album bursts out of the gate with "Coming On" from Antennas Up. The band's smile-inducing, warm harmonies gear the listener up for what's to follow. Everyday/Everynight transitions in smoothly with "Body Electric," a more ambient, darker sound, but containing the same exuberance as the lead-off track. By track three, the listener is sucked in. Though "Fanclub" is tinged with a dark mood, it's an intensely danceable song that gives us a sampling of the characteristic style of Molly Picture Club. And this is how smoothly the compilation rolls through. Each song flows into the other, even if it transitions from a straight hip-hop jam like Reach's "Move" to Be/Non's beatastic mindfuck "Yoko's Alright." One of the most brilliant parts of this compilation is the gems that can be found throughout. Some of Kansas City's most well-known bands like The Hearts of Darkness and The Latenight Callers are featured alongside newer acts like Schwervon!, relatively unknown bands like Eyelit, and established local legends like Howard Iceberg. Each track stands on its own feet but collectively breathes the spirit of Kansas City music today. Les Izmore's rhythmic flow in "Debt on Me" delivers just as strongly as Marco Pascolini's squealing guitar in "Sparkin Your Mama Sweet 2," and also in "King of the Soapbox Derby." The album comes to a twisting downturn in Cowboy Indian Bear's "The Hunter and the Hunted," and briefly exhales at "Six Foot Dreams." And that's just disc one. If unprepared, "Diablo Diablo" will blow the listener away with John Bersuch's tribal drum beats. The second disc gives no warning that it will relentlessly but pleasantly bash you with infectious pop hits from The ACB's and The Empty Spaces into fiercer, bolder rock from The Beautiful Bodies, finally toppling you over with Terra Peal's brazen, unbridled screams in "Blue Light." Then another short breath into Lauren Krum and Jimmy Fitzner's serene country vocal melodies, and the album takes a rootsier direction, which builds up to crotch-kicking screams from The Atlantic and double-bass tremors from Hammerlord. Yet again, it manages to cool itself off into an assuaging denouement. First, it winds its way back into a hypnotizing tone from Expo '70 and Umberto and levels off with entrancing but accessible offerings from Akkilles and Katlyn Conroy's project La Guerre. In the last moments of the compilation, we get a prolific, sincere delivery from Abigail Henderson. There seems to be no more fitting of a choice to end this album than with the intimate sounds of Tiny Horse in "Ride." The honesty of this final track makes it an astounding culmination of songs from a bill of fine acts. The emotions gleaned from Henderson's words and Chris Meck's complementary guitar melodies speak the strongest volumes of any track present. And with that heartstring-tugging grasp, it lets go. Michelle is editor-in-chief of The Deli - Kansas City. She also has a weekly column with The Kansas City Star and reviews music for Ink. She plays with Deco Auto, Drew Black and Dirty Electric, and Dolls on Fire. Her favorite pastime is wearing hoodies and drinking hot tea.